As the weather warms and we start opening windows, the sunlight pouring in sheds light, literally, on a huge ugly truth – dust – and it is everywhere. They call it Spring Cleaning for a reason and it is officially the time to get started. First, it is important that we understand why a deep clean in the spring is important. With nice weather comes the end of cold and flu season. This makes it the perfect time for disinfecting. Taking care of workspaces like desks and phones will keep employees healthy in the warmer weather. 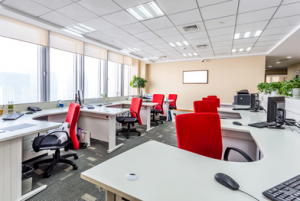 If building occupants maintain their personal workspace it will be easy to maintain a healthy environment. While cleaning workers will remove trash, dust, and vacuum, they rarely invade the personal space of individual workers. This can lead to clutter and bacteria build up. It is recommended that employees use a disinfectant to clean their personal space, and their phones as well. Cleaning vents on computers, printers, and other electronics will also be useful in keeping them from overheating. It is also a good time to evaluate things like office chairs, old ones could be hurting your employees. Spring cleaning isn’t just about dusting your shelves and donating old clothes, though those things are important. It is the time of year where we can get rid of the winter blues and all of the sickness that came with them. So invest in some basic cleaning supplies, or maybe some more intense ones, and get deep cleaning! PreviousPrevious post:March 24th is World TB Day & Other Things You Didn’t knowNextNext post:Attack of the Superbug!